1.) Young people are heavy users of social media, but are unlikely to vote. 2.) Older folks are likely to vote, but are much less involved in social media. Thus, the reality is that social media is best at reaching those least likely votes. 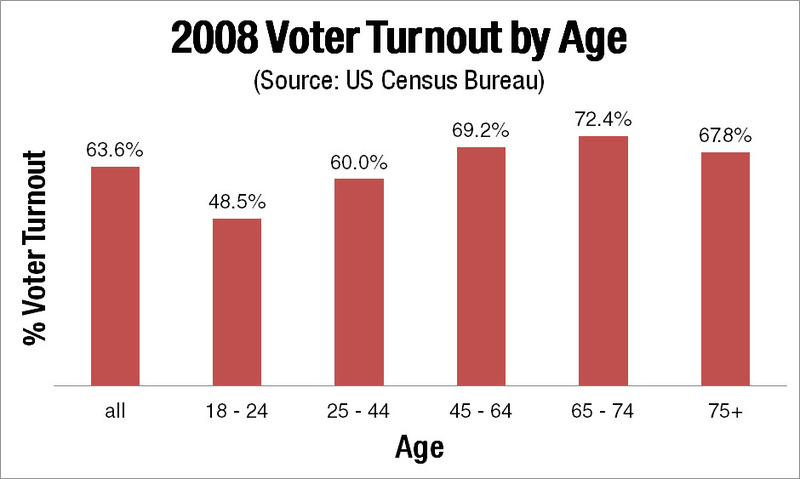 In its 2008 post-election analysis, Pew found that while 72% of Americans 18-29 year of age were using the Internet for political activities or information gathering (and 49% used social-networking sites for these purposes), only 22% of Americans 65+ years of age engaged in such activities on the Internet (and a mere 2% did so on social media). Table compiled by PJ Rey using data from the US Census Bureau. While the influence of social media may be somewhat over-hyped, social media should not be ignored. This age-based line of analysis does, in fact, indicate that social media is likely to play a more significant role in 2012 than it did 2008, because, though a majority of Americans 56 years and older are still not on social media, the number of users in age group has tripled in just a few short years. The inverse proportionate relationship between social media use and voting will likely attenuate the impact of organization and communication through Twitter, Facebook, and other such platforms in the coming election; nevertheless, social media is on course to continue playing a larger role in most aspects of our lives, including electoral politics. cool analysis, pj! though, i would not downplay that the strength of the inverse relationship between social media use and likelihood to vote is weakening. also, is correlation the appropriate method here? imagine a future where 100% of people younger than 65 use social media and say 80% of 65+ use social media and still vote more often. in that scenario social media is hugely important, but we still have that same negative relationship. perhaps we should look at the number of social media users multiplied by their likelihood to vote? in any case, as younger social media users get older and vote more, and as older voters use social media more, we see a fairly linear and positive trend towards the increasing importance of social media. I have to say. As a Canadian, it is very interesting to watch the buzz which surrounds American elections. It is really a whole different world than us! But I am really curious to know what cyborgologists think the effects of social media are likely to be on American electoral politics. Is there any empirical work done on the role that it has played in previous elections? what kind of narrative do you think that data would paint?